While we know of a couple of campsites in Paris, a quirky caravan park in central Berlin and a glamping site on a rooftop in Bristol, there currently aren’t many decent campsites actually inside London city itself. Nevertheless, the surrounding counties offer plenty of opportunities and with good rail links out of the city you can easily visit campsites near London without a car (see how to visit campsites near London). Families often choose to head further afield into East Anglia – the north Norfolk coast is a particular popular camping spot for Londoners – but, if you want sites closer at hand, you needn’t travel such a long distance. From South London, Kent, Surrey and Sussex are most convenient, with many campsites less than an hour from the capital, while, to the north, heading west to Berkshire and Bedfordshire is a wise choice. The campsites in these western locations make the most of the Chiltern Hills, which run in a chalky band across the Home Counties, as well as the River Thames, which is home to some excellent riverside campsites. Those in the south, meanwhile, capitalise on the scenery of the South Downs and Kent’s High Weald. It’s no surprise to learn that the closest campsites to London fill up on weekends and are much quieter during the week. For maximum seclusion, it’s worth extending your holiday into the week when sites are much quieter – though in the school holidays the mid-week days can still be busy too. If you’re planning on visiting a campsite on the weekend, make sure you book well in advance. Campsites near London can book up months before and the small, independent campsites recommended here on the Cool Camping website are often the earliest to get full! Driving is the easiest way to reach many of the campsites recommended on the Cool Camping website but that are several spots that can be conveniently reached via public transport. Check the public transport section on our campsite pages for clear details on how to reach each site and look out for small campsites where the owners may be willing to pick you up from the station (we often make it clear if they do). The likes of Lee Valley Almost Wild Campsite and Cookham Lock can also be reached by bicycle, located as they are by a riverside towpath. In fact, if you have a canoe you could even paddle to them from the city! If camping’s not your thing, then there are many glamping sites near London too. Check out our dedicated guide to glamping near London for the full range of options. Just like campsites, these glamping options are in high demand and should be booked early to secure your place. Whether it’s tree houses, yurts, shepherd’s huts, bell tents, safari tents or something more quirky, there’s plenty of choice. Some places, like Blackberry Wood in East Sussex, even have a whole variety of glamping abodes, including a double decker bus and an ex-RAF helicopter! For most people escaping the city, wild camping is hugely appealing given its contrast with urban life. It’s not legal to wild camp in most of England, though, if you abide by the golden rule to ‘leave no trace’ and follow the important tips in our wild camping guide, it’s still possible to wild camp in a responsible (and hidden) way. Our advice, however, is to stay on the right side of the law and head for one of the ‘nearly wild’ campsites on the edge of the city. Campfire-friendly Badgells Wood has a fantastically wild feel and pretty much lets campers loose in a ginormous stretch of woodland. While, Lee Valley Almost Wild Campsite does exactly what it says on the tin. This wild campsite is within easy cycling distance of North London, with the riverside towpath starting near the Olympic Park. Pitches are tucked in small clearings and you can launch canoes straight from the campsite. Campfires permitted. Family-friendly Welsummer is featured in our brand new guidebook, Cool Camping Kids and is ideal for little nippers to explore with woods, meadows and streams. Campfires permitted. On the banks of the Thames, this large campsite has ample facilities for families and good access for boating on the river. 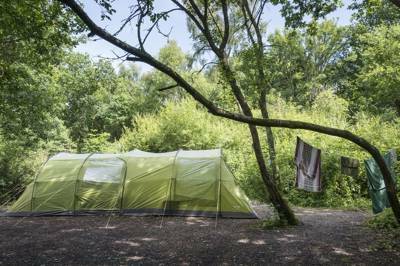 In the grounds of the National Trust-owned Polesden Lacey Estate, this pop-up campsite has acres of space and campfires at every pitch. Seemingly wild and unmanaged, this woodland site is carpeted with bluebells in spring and has excellent views from the edge of the trees. Campfires very much encouraged. Another wild wonder, this time in Sussex, Eco Camp UK has the most five star reviews of any campsite on the Cool Camping website and is deserving of the praise. Campfires permitted. Not so secret and appearing in the Cool Camping guidebooks since our very earliest editions, this classic, traditional campsite is easy to reach from London but also a short drive from the south coast.